The red rose is classic. It's timeless. But that doesn't mean it has to be boring! Here are 15 fresh ways to use this beloved flower from one of our favorite florists, Tantawan Bloom. Decorate your sweetheart table with a sleek, streamlined rose table runner. It's like a glam version of a palm tree, with roses surrounding the cylinder vase, candles cascading up the tree, and oversized tropical leaves topping off the look. Why choose just one centerpiece style when you can have three? 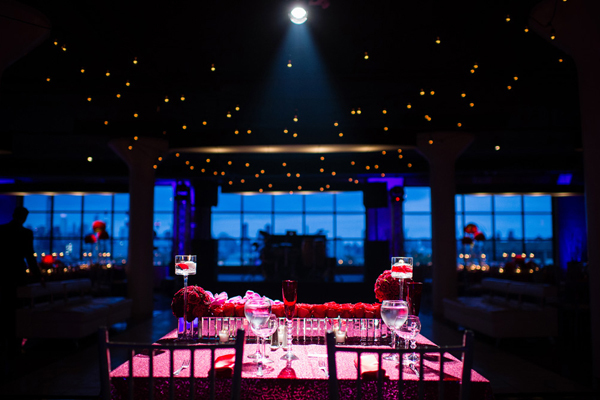 Glass orbs suspended from a rose cloud add a bit of whimsy to your wedding look. Get the best of both worlds with a high-low centerpiece. Accent a modern lamp-inspired centerpiece with this classic bloom. Roses winding up the vase lend a garden-fresh appeal. Top each mini arrangement with a candle for a romantic vibe. Branches bursting from the roses make a bold impression. Mirrored vases and a sequined tablecloth help give these multi-hued red roses a modern touch. Add a whimsical touch by stringing vines through the roses. Clean and streamlined, place tight balls of red roses atop clear cylinder vases. Add volume by mixing masses of greenery and hydrangeas with your roses. Create an ultra-romantic ceremony backdrop with bud vases and piles and piles of petals.